Having friends over for a bonfire this summer? Or maybe you are having a birthday party like I am for my youngest (turning ONE!). Well, at every get together and party there must be good food and Tombstone has you covered this summer with their newest pizza flavors: Diablo, layered with spicy chorizo and fiery sriracha and Bratwurst, topped with a ballpark brat, both made with 100% real Wisconsin cheese. 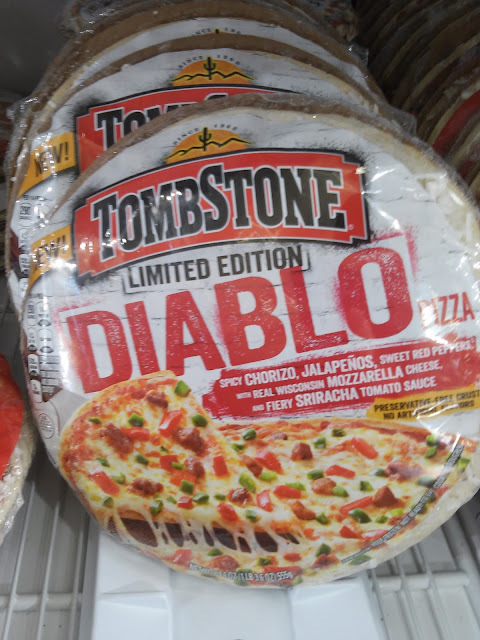 Tombstone Limited Edition Diablo Pizza: features spicy chorizo, jalapenos and sweet red peppers with real Wisconsin mozzarella cheese and fiery Sriracha tomato sauce on a preservative-free crust. Tombstone Limited Edition Bratwurst Pizza: features slices of premium bratwurst, green bell peppers, onions, a blend of real Wisconsin cheddar and mozzarella cheeses and our zesty tomato sauce with a hint of spicy brown mustard on a preservative-free crust. You can purchase these unique flavor combinations from Tombstone for a limited time in stores nationwide for retail price of $4.99. Tombstone is generously offering (FOUR) Free Tombstone Vouchers to a lucky winner!